Oh Baby, I LOVE BOSU. A few months ago…I started a new class at my gym called BOSU Challenge. It quickly became a favorite. (Seriously, my boyfriend bought me my own BOSU ball as a gift). For those of you unfamiliar with a BOSU, it is the funky looking piece of gym equipment that resembles half of a yoga ball you’ll find stacked in the corner of most fitness centers. If you haven’t heard of a BOSU (or just haven’t paid much attention to the stack of them at your gym), my suggestion is to fix this immediately. Ask a trainer, take a class, YouTube some exercises. Do SOMETHING. You’ve GOT to try it! I have started noticing my body was getting fitter and firmer in all the right places after only a few classes. And you know what…it’s made me feel so much more confident and strong inside and out! Yesterday, I took a class at the Boston Center for Adult Education (a great non-profit adult education center where you can sign up to take a fun class on anything from cake decorating and cocktail making, to learning a language and designing a website). I’m a big nerd and LOVE school (I’m currently trying to find a way to go back for my Master’s– fingers crossed) so when I found out there was a one time, all-day writing class being taught by all the top Boston magazine editors…I was SO in (a full post about my whole day at the BCAE is coming soon!). Anne Vickman (Associate Editor and Weddings Editor for Boston Magazine) taught the class and gave our group a bunch of fabulous tips on how to make it in the writing world. She then had us spend 45 minutes writing an article that could potentially be printed in Boston Magazine’s “This is Just a Test” section, which highlights new health, beauty, or lifestyle trend worth testing out that’s relevant to the Boston area. Immediately, I KNEW I had to talk about BOSU. So, I thought I’d use this post to share the article I submitted at the end of my class. It recounts my first day of BOSU Challenge. I hope you like it! Also, please feel free to offer any feedback, I’d really appreciate it! 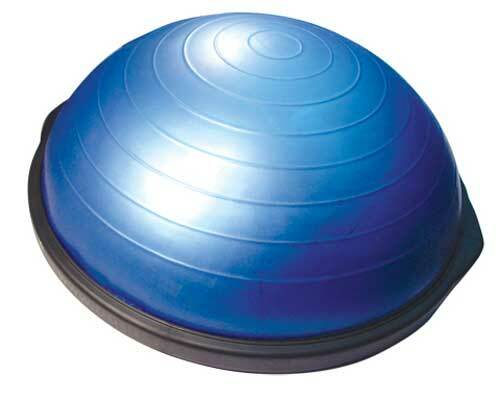 And seriously…go buy a BOSU ball or just join Healthworks. It’s SO worth it! A crowd of determined women of all ages begins squeezing into the main fitness studio at the Healthworks Fitness Center, Cambridge. Immediately, everyone starts scrambling to stake out the prime spots in the class, marking their territory with blue BOSU Balls, yoga mats, and various sized free-weights. For those of you unfamiliar with a BOSU, it is the funky looking piece of gym equipment that resembles half of a yoga ball you’ll find stacked in the corner of most fitness centers. It is most fitting then that the hour-long class the women (including myself) are waiting for is called BOSU Challenge, a favorite among Healthworks members. This is quite evident given the fact that class is already filled past capacity and it hasn’t even begun yet. Yeah, it’s just THAT good. To give a little bit of background, the BOSU Balance Trainer was invented by David Weck in 2000, and since then, it has become an increasingly popular piece of gym equipment given its ability to intensify cardio, target multiple parts of the body at once, and more importantly, obtain GREAT results. According to the official BOSU website, the word “BOSU” originally stood for “Both sides up,” since it can be used on either side, the platform or the dome. Over time its meaning has been altered to stand for “Both sides utilized” as a way to showcase its versatility compared to more traditional training. Training with the BOSU ball facilitates functional balance training, which “encompasses an evolved performance approach that involves the whole body” and requires some degree of motion and stabilization the entire time. Bosu Challenge does just this, and incorporates a variety of high-intensity drills, cardio combinations, and strength training moves using the Bosu ball, free weights, and yoga mats. Each move requires you to engage your core and focus on balance, thus giving you the perfect all-over, summer-body workout. While still waiting for class to start, each additional woman walking into the room is immediately hawk-eyed by the rest of the group. No doubt they are attempting to inconspicuously search her hands for the class’s coveted “golden ticket.” This ticket means she has signed up for the popular class well in advance, thus confirming her entrance. Even so, this doesn’t keep some people from trying sneak in to one of these already crowded classes sans-ticket. Class-goers and instructors alike frown upon this practice. To secure a spot for BOSU Challenge, taught by the infamous “Sean” at Healthworks gyms across the Boston area, you had better sign up at least 24-hours in advance. To gain entry into this particular Saturday morning class, I was forced to set my alarm for 1:00 a.m. on Friday morning and sign up on the Healthworks website. At exactly 11 a.m., and Sean comes strolling into the studio wearing a black warm-up suit and matching black sneakers with bright yellow bottoms. He looks like a much larger, much more solid, much more intense version of Billy Blanks, but something about him is kind and sweet, in a “big-teddy-bear” kind of way. Some of the women in the front row (who have already been warming up with squats and lunges) greet Sean with high-fives. I can tell just by looking at them that they’re the class regulars. They’re in great shape, and I wonder if they have Bosu Challenge to thank. “Okay guys! Get movin’!” he shouts as he demonstrates running on and off the Bosu. After a quick warm-up, he gets right into the routine. The next thing I know we’re doing mountain climbers, laterals, planks, leg-lifts, push-ups, burpees, squats, lunges, bicep curls, shoulder presses, and jumping jacks without stopping to rest in between. Only 15 minutes have gone by and I’m already dripping with sweat. There is no doubt I’m more exhausted than I’ve ever been before after a fitness class, but it’s the BEST kind of exhaustion to feel. It’s the feeling you get when you know you’ve given everything, and not an ounce less. I have no doubt in my mind that taking this class every week will make your muscles stronger, your body more fit, and your trouble spots firmer just in time for bikini season. After all, I feel like my backside has risen two inches already, and that’s just after completing one class! No wonder those women in the front look so great. They keep coming back for more! This entry was posted in Fitness, Uncategorized and tagged Bikini, Bosu, Bosu Ball, Fitness, Healthworks, summer, Workout. Bookmark the permalink.